What do you do on nights like this? Well if you haven’t seen the weather a big line of storms have rolled across KS. This has kept me inside all evening. On these nights I like to prepare for my next adventure. 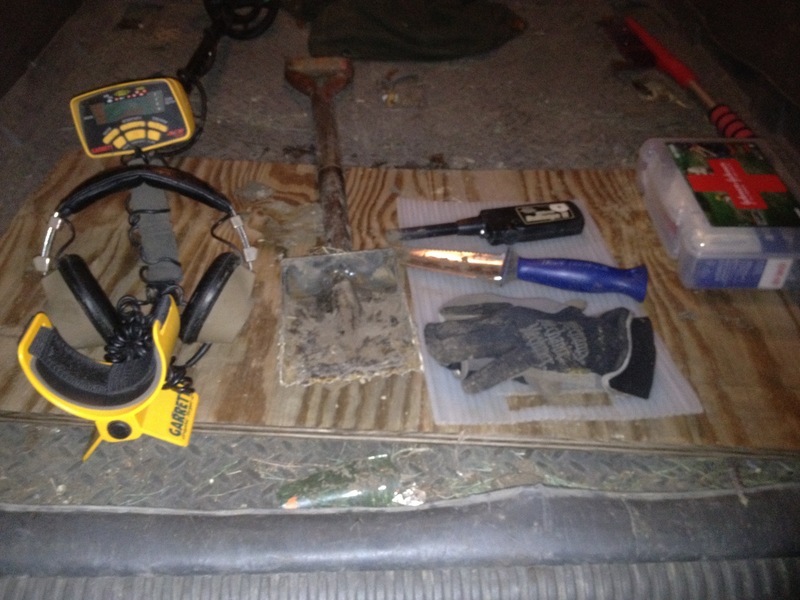 This means doing research, cleaning up my gear, and pondering on the whys and why not’s of metal detecting. Here are a few more details about what I do. 1- Research: My favorite way to research is to look at plat maps from the late 1800’s and early 1900’s. I have a few places that I have been eyeballing while honing my digging skills to the point I feel proficient enough to go on private property and ask permission. For example there is a church down the road that has been there since 1912. This particular church started out as a very small church. They have expanded but still have a huge lush, perfectly manicured lawn. I can only imagine that over the last 100 years many people have played games, had picnics, and dropped coins in that lawn. I drove by it tonight and using a hint from PullTabMiner noticed that the trees haven’t had fill dirt piled up around the trunks. In my mind I can’t wait to hunt this property. 2- Cleaning: I have the same philosophy on this as I do any mechanical device. If you take care of the equipment it will serve you better when you need it. This includes wiping down the Garrett Ace 250 and White’s pinpointer with a damp rag. I also like to take my shovels out and clean them up. It amazes me that no matter how careful you are your equipment will get dirty quickly. 3- Pondering: This where I like to reflect on the hunts of recent. Think it over in my head and get a better understanding of what happened. For instance, I hunted a piece of land where an old school house was it was on some 1905 plat maps and disappeared in 1915. The land is still owned by the township. The particular day I hunted it the weather was cold and damp. It was 18 degrees to be exact. Was my mind in the right place? I had only been using my metal detector for about two weeks and I’m sure I was moving way to fast. I will definitely be hunting this site again. Hopefully the weather will be great and I will be moving slower. Maybe I will find more than electrical connectors and trash. As a rookie in this hobby it seems like so many other hobbies that it doesn’t take but a few minutes to learn how to use the detector but it may take years to master. The whole time being totally addictive! Don’t be Saucering! 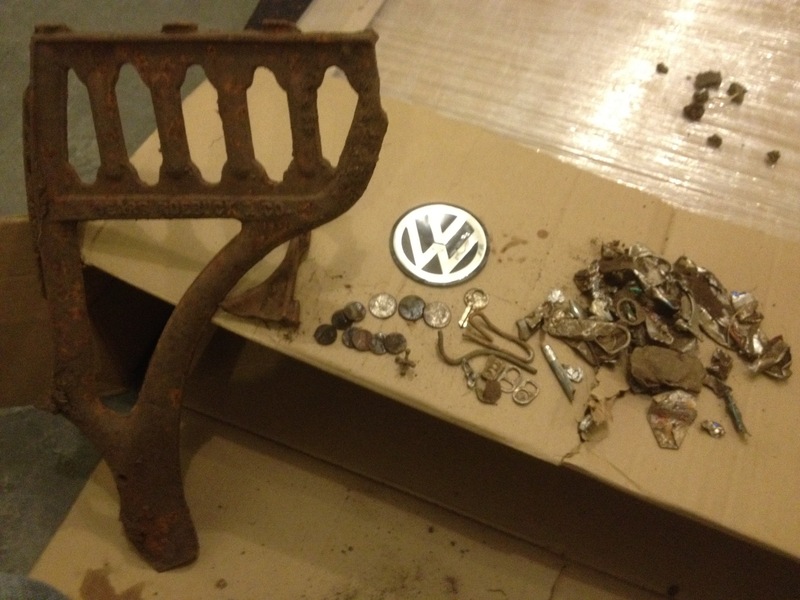 So my son wanted to go metal detecting tonight. When he wants to hunt I like to take him to the totlots. Easy detecting and easy digging for him. I however get quite bored when hunting these because it is so predictable. 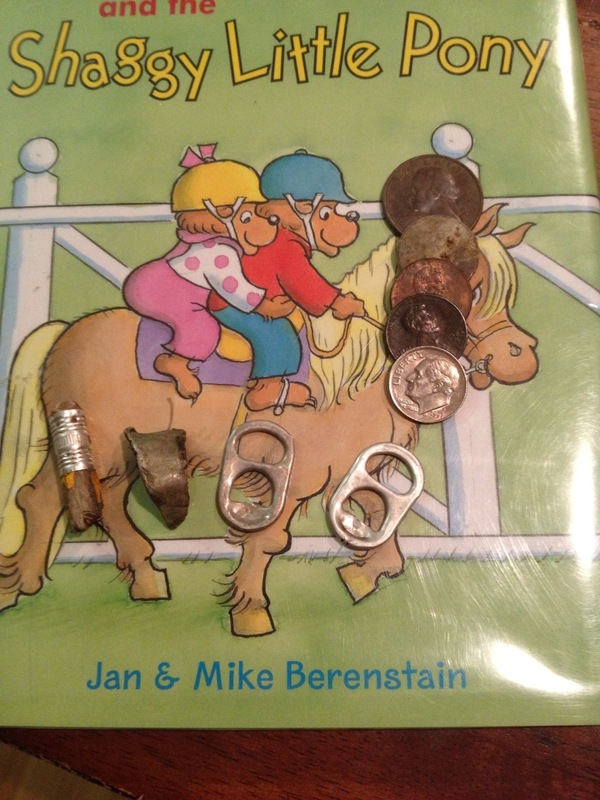 I think I have matured in my metal detecting. When I first started finding a modern coin was exciting. 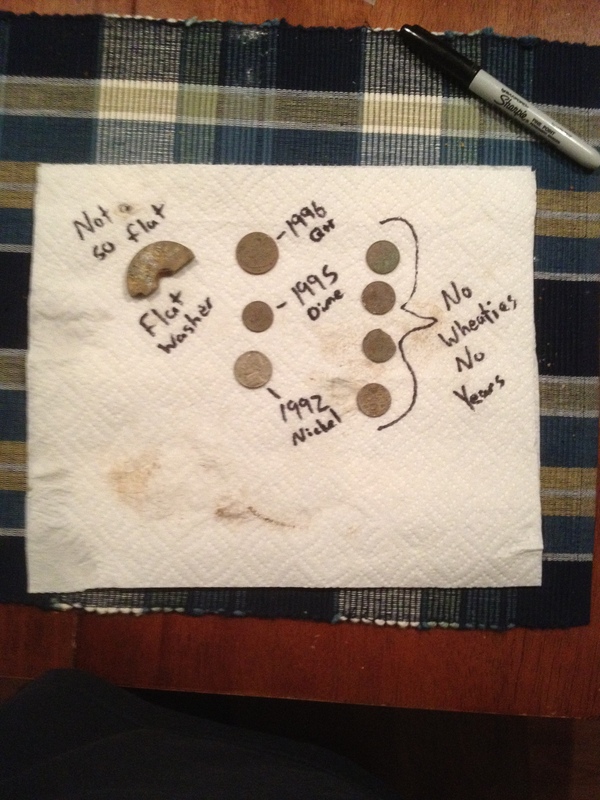 Now I want to find older coins and relics! I haven’t ran down my list of hunting equipment. Here is a list of the equipment I use. And of course my opinion of them after about 80 hours of use. 1- Garrett Ace 250, it’s a great entry level machine. Pinpoint option is a must in my opinion. This machine may not go as deep as other machines but it does great for the money. 2- Whites bullseye pin pointer, in my mind this is a great tool. It allows you to more precisely figure out where your target is once you dig the first plug. I spent about a month without one. The first hunt I went on with members of the forum a very generous metal dectorist gave me this. I couldn’t believe how much easier it was to find targets. This little one works pretty good but my next will be a Garrett Propointer. Ames 7 in 1- great tool for the money. Lesche diggers are more popular but much more expensive. Custom shovel- I designed this and had a local craftsmen make it. It works great! Gloves are a must and the first aid kit is just a good idea! We are going night hunting! The whole family decided we would spend this afternoon at the playground. The boys grabbed a four square ball and I grabbed the detector. 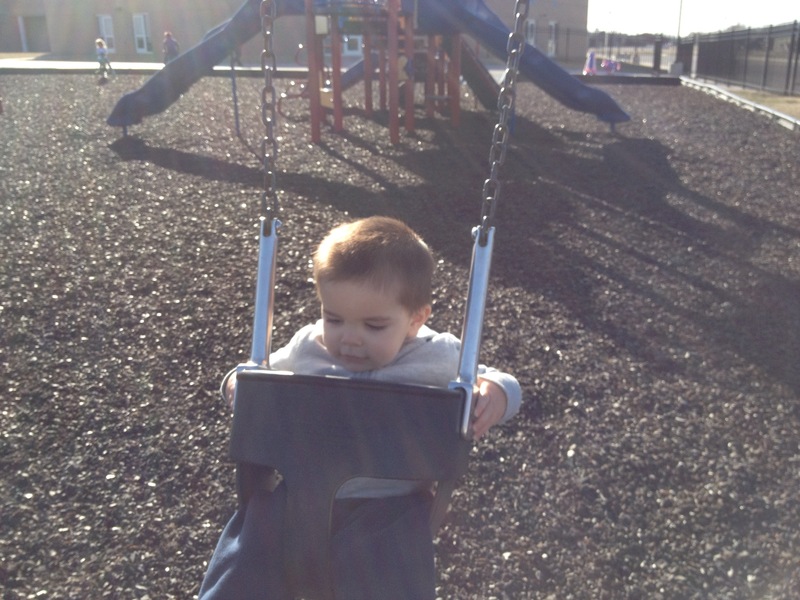 We spent a good hour and a half at the playground. My lovely bride even joined in on the four square fun. 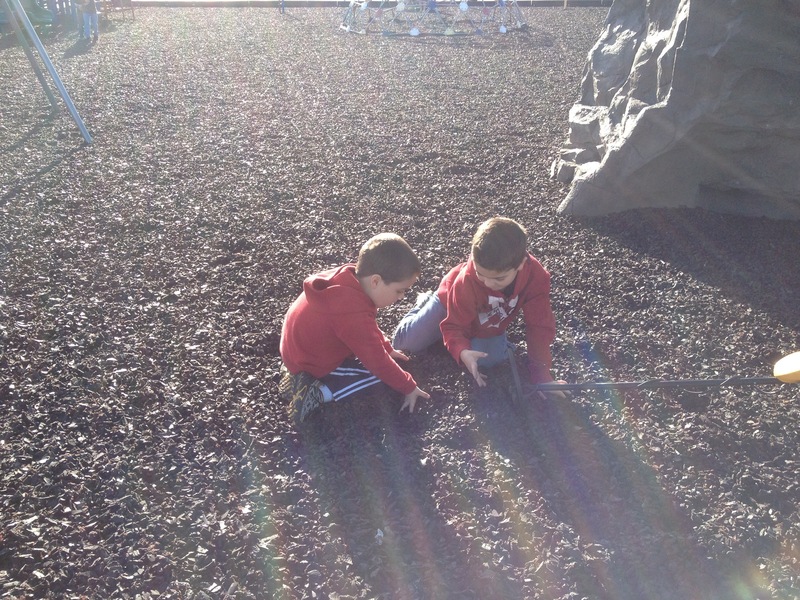 We ended up finding about $.70 and got some exercise. It’s being with friends and family in the outdoors that really gets me excited! Good times! This morning I met up with PulltabMiner and spent a few hours detecting an old school. We found several neat things but no silver or gold. Pulltab found several wheat pennies in a very isolated area. The oldest coin I found was a 68 penny. 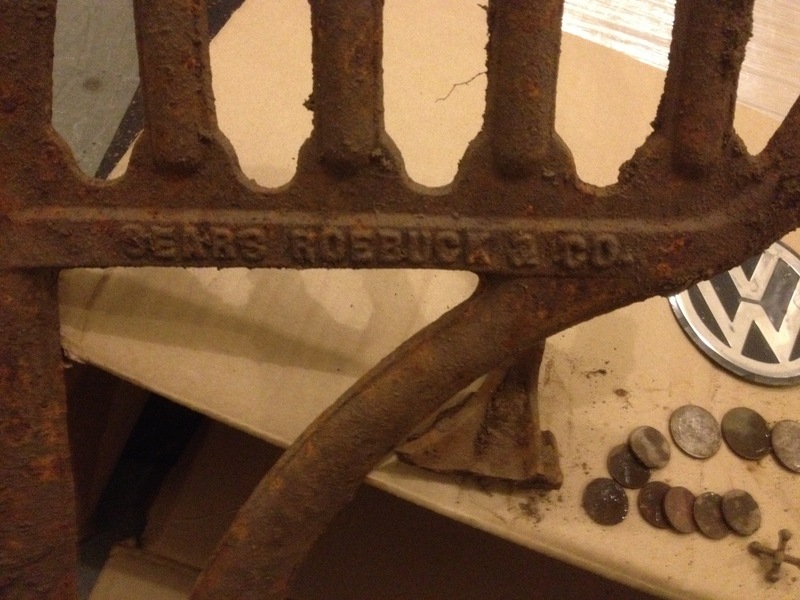 Had a great time digging up the Sears and Roebuck desk leg. Anybody have ideas on the age of it? I spent about an hour and a half at the old school tonight. Dug about 35 targets. Lots of pull tabs. Very little clad. It amazes me that our soil corrodes newer pennies so quickly. All in all it was nice to get out on a peaceful night with just my MD (Garrett Ace 250) and the coyotes howling in the background! Hurry up and wait for it! I am sitting here anxiously awaiting the arrival of my wife. I was wanting to get out and detect before dark… Will definitely need a light for this evening. I plan on hunting where there was a high school building previously (1910-1960’s). I have been hunting this area for a couple of weeks and have yet to find anything worthy of mention. There has to be some silver out there though! I will keep trying… Wish me some big silvers! Welcome to my blog. I look forward to posting my outdoor adventures with everyone.